Digital images courtesy of Colby College Library. In making these images available, we also consulted with ssipsis’ daughter, Pam Outdusis Cunningham. 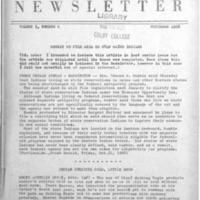 ssipsis (Thompson, Eugenia), “Maine Indian Newsletter (Nov. 1966),” Indigenous New England Digital Collections, accessed April 23, 2019, http://dawnlandvoices.org/collections/items/show/474.